On April 30, 2015 Project Tomorrow released the report “Digital Learning 24/7: Understanding Technology – Enhanced Learning in the Lives of Today’s Students” at a Congressional Briefing held in Washington, DC and online in a special live stream of the event. Julie Evans, Project Tomorrow CEO, discussed selected student national findings from the Speak Up 2014 report and moderated a panel discussion with students who shared their insights and experiences with digital learning. Whether driven by parental demands for increased personalization or higher goals for student achievement, many administrators are finding that blended learning environments hold great promise. In fact, 45 percent of district administrators in this year’s Speak Up surveys indicate that the implementation of blended learning models within their district was already yielding positive results. Students in blended environments use technology more frequently than their peers in more traditional classroom settings. 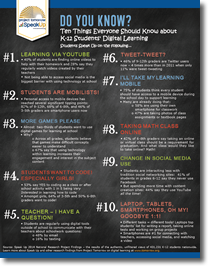 In addition to use in the classroom, these students are also more likely to self-direct their learning outside of school by tapping into mobile apps, finding online videos to help with homework, emailing their teachers with questions and posting content they create online for comment. When students have access to technology as part of their learning, especially school-provided or enabled technology, their use of the digital tools and resources is deeper and more sophisticated. The availability of online learning continues to increase with only 27 percent of high school principals reporting that they are not yet offering any online courses for students. Interest among students continues to grow, with 24% of high school students saying they wish they could take all their classes online – a large increase from 8% in 2013. 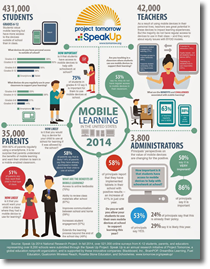 Almost three-quarters of students with school-provided devices as well as students with limited or non-existent technology access at school agreed that every student should be able to use a mobile device during the school day for learning. Students connect the use of technology tools within learning to the development of college, career, and citizenship skills that will empower their future capabilities. Digital experiences for students in a 100 percent virtual environment are much different than those in traditional schools. For instance, 72 percent of high school students in virtual schools take online tests, compared with 58 percent of traditional students. Students see the smartphone as the ideal device for communicating with teachers (46%) and classmates (72%) and for social media (64%). A gender bias exists in STEM interest –middle school girls are 38% less likely and high school girls are 32% less likely than their male peers to say they are very interested in a STEM career. To access information on the second congressional briefing held on September 24, 2015 and request a copy of the national report on Educator and Parent data, "Digital Teaching 2.0 – Activating Technology-Enhanced Learning in America’s Classrooms” please click here. Over 70 people attended the Congressional Briefing including congressional staff members, student and staff representatives from some of our Speak up schools, and staff from many of our sponsors, champion outreach partners and non-profit partners. Project Tomorrow was very pleased to welcome staff from A.W. Systems & Solutions, AAAS RET., The School Superintendents Association, Achieving Equality, Alliance for Excellent Education, American Meteorological Society, Amplify, Apple, Arfstrom Consulting, Arlington Public Schools, Athena’s Workshop, Baltimore City Schools, Cesar Chavez Public Charter Schools for Public Policy – Capitol Hill Campus, Common Sense Media, CoSN, CSUSM, Digital Harbor High School, Digital Promise, Discover Communications, EDC, EdTech Strategies LLC, Education and the Workforce Committee, Education Daily, EDUCAUSE, Fairfax County Public Schools, Global Skills X-Change, i2 Capital Group, iNACOL, Intel, ISTE, James Wood High School, Kenmore Middle School, MOB Advocacy, NASBE, NASSP, National Education Association, National Network of State Teachers of the Year, National Science Foundation, NCWIT, Oxon Hill High School, Partnership for 21st Century Learning, Pearson, Prince William County Public Schools, Qualcomm, Responsibility.org, Rognel Heights Elementary Middle School, Rosetta Stone, Rural School and Community Trust, SETDA, SIIA, Teach for America, Tiger Woods Foundation, the U.S. House of Representatives, and the United States Judiciary Committee. Students and parents from Baltimore County Public Schools (MD), Cesar Chavez Public Charter School for Public Policy at Capitol Hill (DC), and Fairfax County Public School District (VA) shared their insights regarding their daily digital learning experiences.